The 9th Namma Bengaluru Awards’ (NBA) was hosted in the city on Monday, 26 March. 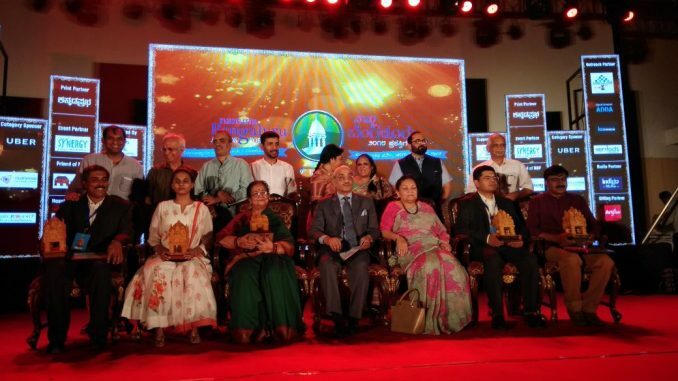 During the celebration, 6 exceptional citizens of Bangalore were awarded for making the city a better place to live by their different and individual contribution. In its course of 9 years, the foundation has always made this effort to recognise and honour the ‘real heroes’ of Bangalore. The jury members to select these nominees are prestigious citizens of the city from all walks of life. They perform a fair and transparent selection. The wines name is only revealed on the day of the event and this has been the tradition for past 9 years. This year too, the same ritual was followed. In the past, many IAS, IPS, IFS and other government officials have been honoured under the Government Official of the Year category. Most of these winners requested to donate the winner’s amount as charity to any foundation, to which Namma Bengaluru Foundation agreed and carried forward the formalities. Every year the nomination for awards is based on themes. This year’s theme was based on Reclaiming Bengaluru. Also, this year focused on individuals, who by their contributions helped in reclaiming Bangalore and made it a better place. 6. Mrs Rukmini Krishnaswamy was honoured “Namma Bengalurean of the Year” award. 1. Friends of Lakes: this group was recognised mainly for their contribution in cleaning the lakes in Bangalore. They began from Vidyaranyapuralake and the work was carried on to 22 more lakes. The group after getting world-wide recognition is now also expanding to other states to clean the lakes. 2. Project Vruksha Foundation: this is an eco-friendly foundation that quantifies the biodiversity through a scientific tree census. This foundation maps the trees in the city for better accountability. It is also a member of the First Tree Committee of Karnataka. 3. Save Pattandur Agrahara Lake: in an attempt to save the lake and lake buffer zone in Pattandur Agrahara Lake, few responsible citizens took it to the roads and demonstrate protest against it. This was followed up by a public protest to save the lake. Since then this group of citizens have been showcasing their protest through social media, press outreach to put pressure on the concerned authorities to take required actions to save the lake. 4. Save Kaggadasapura Lake: after noticing the speedy deteriorating condition of a neighbourhood lake, a group of citizens got together and decided to do something about it. Every Sunday morning this group started organising lake clean-up drives, which spread awareness amongst the concerned authorities and people about the urgent need to rejuvenate the lake. The Namma Bengaluru Foundation began in 2009 and since then it has maintained its transparency in choosing the winner. This has also motivated the citizens of Bangalore to nominate the deserving candidates for the award, who really are making a difference through their contribution. The nomination for this year began in November 2017 and thousands of people were nominated under five categories. The nomination was open for a month. Of them, 41 were shortlisted and the jury members personally met every shortlisted nominee to talk to them and get to know more about their cause. This helps the jury to decide the winners. 1. Mr Sanjeev Dyamannavar for Citizen of the Year: he has been one of the main campaigners from past 10 years to get the Commuter Rail for Bangalore. Apart from this, he has also been actively participating in working for City Public Transport Issues, Metro, BMTC, the Pedestrian facility including FOB, Skywalks etc. He also launched a platform for informed debate regarding different issues in Bangalore. The debate was between domain expertise and officials of civic agencies against the citizens. Not only this Sanjeev is even the member of Jakkur and Rachenahalli lake protection committees. Other than this, Sanjeev apart from keeping an eye on the development work of the railways and bringing transparency in Bangalore Metro, he also contributed to keeping the city clean. Sanjeev helped in wastage segregation by dry leaf and E-waste compost near residential areas. 2. Mr Rasheed Kappan for Media Person of the Year: as the award suggests, he has been an important media person over the years bringing to light many stories that are impacting Bangalore. Urban issues were his main focus. His efforts had forced the authorities to put a hold on the Skywalk project at Mahatma Gandhi Circle. His articles, published on the front page underlined the destruction of greenery around the place that the project was causing. He has also researched and written analytical stories on the conditions of the lakes in Bangalore, due to pollution, urban rail project, steel flyover project, etc. 3. Mrs Dipika Bajpai for Government Official of the Year: she is the Deputy Conservator of Forests, Bangalore Urban Division. She is actively working on creating awareness and educating the people about the importance of conserving forests. She initiated a mass planting programme. As a result of her efforts, Dipika also managed to recover 149 acres and 13 guntas of forest land that were encroached upon in JB Kaval, Buttanahalli, Kaggalipura, Yelahanka, Sunkadakatte, Mylasandra and Thurahalli. 4. Mr Prashant S B for Social Entrepreneur of the Year: he is the Chairman, Nayonika Eye Care Charitable Trust. The trust was founded by Dr Surekha (president) and Prashant S.B (chairman) in 2010. the trust aims at advancing the care of eye and vision through creating awareness, treatment and monitoring. They wish to make a better India with a vision for all by providing affordable/free treatments to all those in need. 5. Ms Vidhya Y for Rising Star of the Year: is the Co-founder and Trustee of Vision Empower. She set up this organisation with the aim to make the education, especially in Maths and Science easily accessible to the visually challenged students. The organisation motivates the visually impaired children to opt for subjects like maths and science, which are more difficult for them due to the visuality challenges. They provide accessible content and training modules through technology whenever required. So far through her initiative and councilling, 75 students have benefitted. Vidhya also gives motivational sessions and hosts radio shows. 6. Mrs Rukmini Krishnaswamy awarded NammaBengalurean of the Year award: is the Director of Spastics Society of Karnataka. She mainly focuses on special education to children with special needs, training the parents of the children who have special needs and training the teachers to handle students with special needs. She is also a National Awardee in the field of Rehabilitation Education and until now has helped around 70,000 children. The Namma Bengaluru Awards is an initiative of the Namma Bengaluru Foundation’s to thank the real heroes of Bangalore, who in their own way, trying to make Bangalore a better place to live. By parting these awards the foundation also wants to motivate the citizens to do such works that will help in building a better society. Kareena Kapoor and Deepika Padukone, Somethings Brewing!